Here’s detailed steps on how to install macOS Mojave on a hackintosh using the Clover EFI Bootloader method. With the release of Mojave 10.14 and even High Sierra 10.13.6 and Apple has become more aggressive in pushing people to use their new file system introduced in High Sierra called Apple File System (APFS). If you run the Mojave installer from High Sierra the drive will automatically be converted over to APFS from HFS and now ignores any flags that would prevent the conversion at least in Beta. I recommend placing Clover Configurator or another EFI mounter on the flash drive or better a separate flash drive so that you may complete the last step if by chance you don’t have internet access. Clover Configurator or another EFI mounter. After pasting the Clover Boot folder onto the UEFI partition of the flash drive it’s now time to Boot into the UEFI of the macOS USB flash drive installer to load the Clover Boot Menu. I recommend setting the flash drive as the priority or first boot volume in BIOS because you’ll be booting into it multiple times until the install is complete and the Bootloader is transferred to the drive macOS is to be eventually installed on. If the USB drive isn’t set as the default boot volume in BIOS you can change the temporary boot device when the boot screen appears. Usually the button that needs to be spammed is F8, F10, F11, or F12. When the temporary selection screen appears Select UEFI : (USB Device Name). Installer will now slowly load… At first you will seen the Apple loading bar below, then you will see a blank grey screen briefly, then the Apple loading bar once again and then back to the grey screen again where the installer will finally appear. When the installer loads we will want to properly format the disk as GUID for hackintosh usability before beginning the install. Now that macOS is formatted as a GUID partition map and there is an empty partition for macOS to be installed on let us begin it. When the restart happens bring yourself back into the Clover Boot Menu and there is now a second option in Clover. Since we can’t disable the APFS conversion in Mojave Beta we will proceed by beginning the second phase of the macOS installer. (Optional) Choose Customize Settings at Express Set Up if you don’t want to be monitored through Location and Siri. After macOS is running on your hackintosh there may be things that aren’t working such as audio, ethernet and wifi and graphics acceleration. If you followed one of our Build Guides return to that guide in order to get everything working. Otherwise check out the guides on how to get various things working. 37 Comments on "Mac OS Mojave Hackintosh Clover Walkthrough 10.14 Install"
I have found that one CAN convert the boot drive to hfs, if they use something like CarbonCopyCloner. 2. Use Disk Utility to erase the Mojave drive. Erase the container. Why format as HFS? I did a clean install to an APFS volume in an APFS container. Hello, all my sata3 powered disks cannot be seen in diskutility (gui nor terminal). Any ideas how to fix this ? is the controller in IDE mode in the bios? I installed High Sierra on an external SSD (Samsung T3). Without any flags, it uses HFS+J. What will happen if we install Mojave on an external SSD (or even an HDD) too? I Copied the EFI Folder from EFI Partition of USB Stick to EFI partition of my Macintosh HD But It wont boot from the hard drive. When I select the Harddrive I get back to the boot prompt or it tells me to select a proper boot device. Any ideas? Check if your motherboard does support UEFI booting, and also check your BIOS settings too, some motherboards let you completely disable UEFI booting, letting only Legacy booting available. Also check your SATA mode, Mac OS only works with AHCI setting. I’m getting yellow screen after first boot in step 4. Any ideas how to fix it? Unfortunately when running Mojave, you CANNOT use a newer AMD video card EVEN IF it is a Metal-compatible card and is supported in Mojave. The newer AMD drivers used in Mojave require the SSE4.2 instruction set. Currently, it is not possible to get full graphics acceleration when running Mojave on a system with a Radeon HD 5xxx or 6xxx series GPU. Mojave will be almost UNUSABLE without graphics acceleration. Weird inverse blue colors will also be produced when running Mojave with one of these video cards installed/enabled. In the future, Hackintosh AMD drivers could possibly be modified to run but not possible as of now. I got a RX 580 and mine is running really smooth. Why it is not possible to use Mojave compatible cards? I am using a 6100 Corei 3 and it is SSE 4.2 compatible. What is the problem? please help! I tried to install a copy of Mojave on my Hackintosh using the above method but the install failed right at the end when instead of getting the home screen I got a bone of my El Capitan backup drives using Carbon Copy Cloner. The backup finished but now the computer won’t boot into Clover from any of the good backups. El Capitan was working well before I tried this upgrade. I’m stucked on Mojave install. After step 2, I don’t have anymore the Mojave screen, only black screen (with white Apple) with white progress bar. I continued restarts, but after install completed, I can’t get 1st start menu, only grey screen with mouse. 1- ears the ssd as APFS. Can you still use NVIDIA GPU on Mojave or High Sierra? Thanks! Where? On the fresh install of macOS?! Huh? It’s not on the USB drive. We’re not on the internet so can’t download it. If I should copy Clover onto another USB then I would’ve thought you’d mention it? Bit confused; also not sure what EFI to mount and copy where once I have clover, but one step at a time. So you say. Thanks. At the top I didn’t appreciate what that was about and moved along. By the bottom I wasn’t looking up top for answers. Consider adding second mention in step 5, just for dummies like me. I got into some wierd issue, after step 3 when i select “Boot macOS Install from “Hackintosh”” for the last time, installer starts but near the end i got the message “Instalation is in progress. Calculating time remaining…” and looks like is stuck. I was stuck as the computer keeps rebooting after the Apple logo on install. I fixed this by editing the config file in Clover Configurator and unticking InjectIntel. Hope this helps other people out there. I can’t get the apple logo .. as after the grey clover screen it always restarts .. any ideas please?? I am facing a problem that as soon as I select the boot os X from install macOS Mojave it reboots the system and shows the clover bootloader again after the system reboots. I have also tried booting with verbose mode but the system reboots quickly. Please help. You could try to use extra boot args, as *cpus=1* without wildcards. Excellent guide, finally let me upgrade my gigabyte z87 system from 10.10 to 10.14. Thanks! I’ve follow this guide and went pretty far, I’ve done the USB bootable installer. I used the “Mojave Patcher Tool” to download a copy of Mojave installer since I have a Macbook Pro 2011 which is not natively supported and I can’t download it natively. So, one I’ve downloaded the installer, moved the installer to the Apps folder, I’ve started this guide. Follow everything and first I has a kernel panic kinda black screen with a restriction sign in black screen white text and gray restriction sign. -v (but changed to a 2.0 USB port, and I could went to the USB port mapping/addressing I think. npci=2000 -v arch=x86_64 (used the 2.0 port, I passed the lang selection on installer, I did the format to my SSD as HFS+ under GUID partition table, verified the date in terminal and was fine. Then I started the install selecting as target my 120GB Kingston SSD, started the installation and while was doing the first stage running around 2 minutes of install, comes up a message “An error occured validating the installer data. The download is either damaged or incomplete. Redownload the installer and try again” and so, the installer stops and force me to shutdown or reboot. I can’t pass this way. Anybody has a golden master clean DMG/APP of the original installer? Is there a way to correct it manually? Could be a config on Clover to solve this? hehehe…you have to download from app store, otherwise it doesnt work! trust me i tried carbon copy cloning from my mbp …wasted like 17 hours in settings of bootloader. Hi after the apple install screen with status bar i get the restricted sign circle with a line thru. anyone have any ideas why. Wanted to say I got past this part. It was just that i was using an HDMI cable, display cable allowed me to see everything. Now I am somewhat stuck at a new part. I get to disk utility, format my SSD, then start installing. It goes to the next screen, and eventually freezes and 2 minutes, I manually restarted the machine, and got the next clover boot option for installing, clicked that, and was on to the next macOS installation screen. 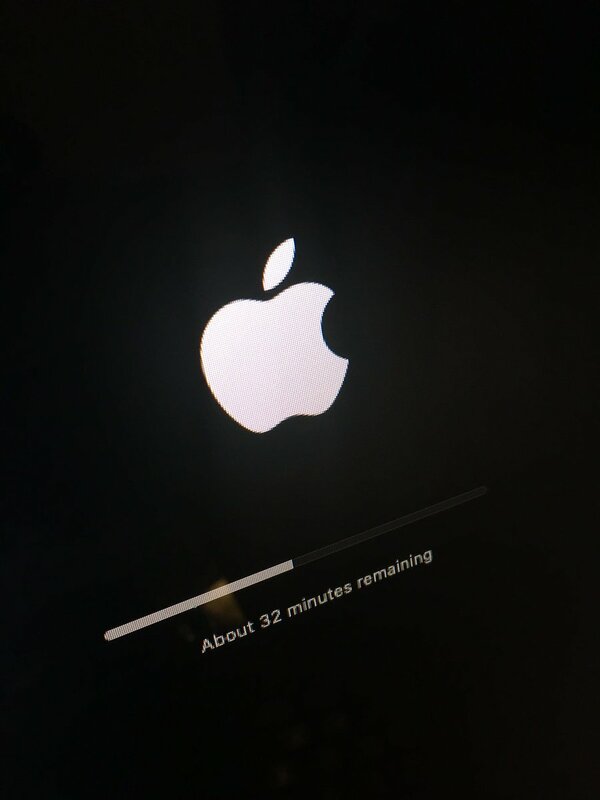 It says 15 minutes remaining, goes down to 14, and then sits there. I let it sit for 45 minutes with no progress, just in case things were going slow for some reason. Any thoughts? I have an asus rog strix B360-i mITX mobo. i5-8600k cpu. g. skill trident z ram. crucial ssd. can someone please help me create the new efi for mojave? i have one for high sierra, but it was made by someone i used to work with. Hello, i’m stuck on the apple logo after clover boot, but not showing the loading bar.